Heavy rains in the last couple of weeks in areas around Belgaum city known for cultivating vegetables have severely damaged crops. 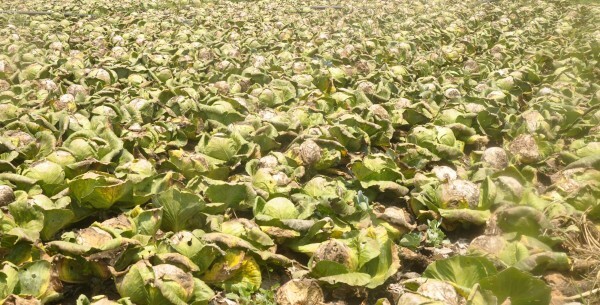 In Kadoli village, cabbage has been cultivated on a large basis, but unfortunately the price of these cabbages are not considered valuable, the farmer get hardly Rs.2 per kg whereas the cost involved in plucking and bringing it to the market is far more higher. Unwillingly he farmers have left the cabbages to rot in their fields which is about 100 acres and the farmers have incurred huge losses. The land is losing it’s fertility, no other vegetable, grain or pulse can be cultivated.